Getting rabbit to breed.....should this really need a how to question? Well, my rabbits are failing to .... breed like rabbits. New to rabbity. Tried following the various online guidance on getting them to breed. Female into the male's cage, and wait and watch for them to do the deed. Boys are trying to do their thing, but just seems the females are not receptive. Forgive my naivety, but I thought the breeding part of rabbits was supposed to be easy! Any suggestions besides give the boy a bath, light some candles and play some Barry White? Re: Getting rabbit to breed.....should this really need a how to question? What is your temperature there? How old are the girls and what breed are they? I will probably write you a book after those starter questions. Thanks Cedar. Temps are not currently crazy hot - highs in the upper 70s/low 80s; lows in the 50s. They are New Zealands. One is older (a couple years) and previous owner said she had several litters with no problems. The other is younger (4-6 months?) and has not been bred yet. How fat is the older one? Weigh her on a good scale, she may be too fat, fat around the ovaries, and rabbits are induced ovulators. Probably put her on a bit of a diet, and try her every few days. Your younger one needs to be 6-8 months old. With induced ovulators... Let the buck breed the doe twice in one session. Then rebreed in 8 hours and you will get larger litters. I would also move the older doe to solitary where she can't see of smell the buck for a few days to a week. Although rabbits do not have a heat cycle, they sorta seem to kinda sorta have a 16-day cycle. Give the older doe a few days ... But it is as coming into fall,cwhich is not a normal time to have a litter. The older one being "a couple years old" especially without a pedigree, I'd be suspicious she is much older, as that is the way it always seems. Thanks Cedar! Will try all that and see if I have better success. May play the Barry White too, just to be on the safe side. Someone else told you the gender right? Never fails. I have some PDF links to send you. Good news.. you have at least two does. Bad news is if the breeder told you one was 4 months, he lied. Often smaller stock they lie about the age in order to sell them. They are both likely 6 months or older. A rabbits gestational period is 30-32 days. So forth the math. Did she get bred before you got her accidental breeding sg home. Go here http://oregon.4h.oregonstate.edu/projects/animal-science/small-animals/rabbits and download the buck production records, and the doe production records. One per animal. It might be worth it to you to get the Rabbit Resource Handbook for Breeding, Market, and Pet Rabbit Projects. Thanks Cedar. The first one that we found was bred by us, but ti didn't look as successful as it apparently was. The second one is the newer doe; I'm guessing they didn't know age and probably had her in with her brothers and sisters too long. But yes, at least we have two confirmed does! Of coarse Murphy delivered these little guys right as we started our first cold weather of the year. 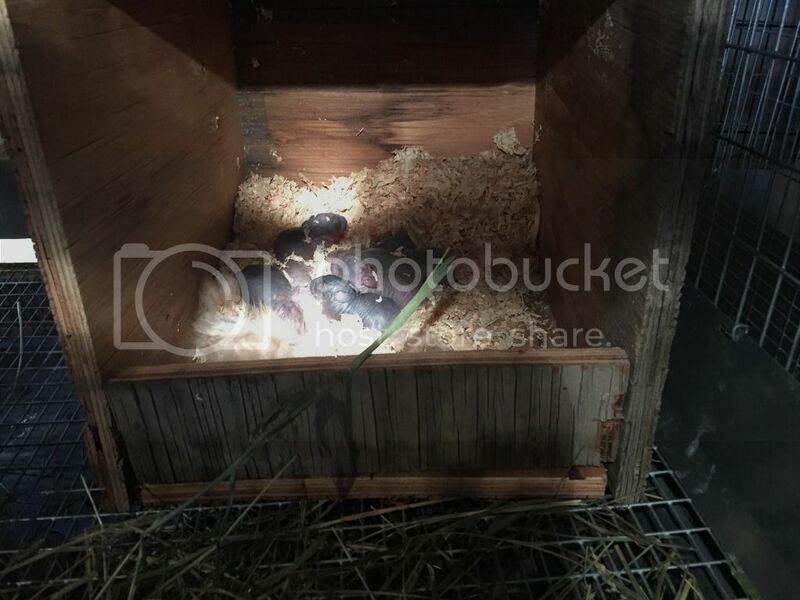 Babies are in a nest box with some pine shavings. I put a warm water bottle in there today to help keep them warmer but figured tonight that wouldn't be near enough so I just put up two infrared lamps aimed at them (same one I have used for baby chicks). Will go back out to check temps -- see if it's helping or if it's too much. We lost the singleton from the second doe already. I don't know if it was lack of heat etc before we discovered it, if not having any siblings made it harder to stay warm, mama didn't do a good job, or what. I'm pretty sure it's the first time for that doe and she only pulled a tiny bit of fur. Plus, as we didn't think she was expecting, there was no next box etc until we going the kit on the cage floor. For the litter we found first, we've lost one, but the others seem like they are doing alright -- that's my expert opinion, which pretty much consists of 'they are still moving'. Hopefully the heat lamps will help. OMG ...heat lamps I hate. They cause so many barn fires. I only use them for chicks if I don't have a brooder. Unless your nestboxes don't have enough straw and fur in them, they are fine at cold temps. I had litters at -20c and never worried until it was colder than that. Rabbit for is warmer than muskox. It is the warmest fur. I was going to suggest putting vanilla on the doe with the larger litters, and popping that single kit in that nestbox. Rebreed that doe who had one tomorrow morning twice. When you get home from work breed her again. Rabbits aree induced ovulators and you will get larger litters. I would not be happy with less than 8 in a litter. With my American breed, I don't accept less than @0-12 in a litter and they have to raise at least ten....AND have those kits are 5-5.5# in 56 days when I butcher. Keep records. Write down these litters too. Get a good scale. Weigh the parents, weigh kits at 56 days. Hmm. 4 more dead this morning. She had moved all but one of the dead ones outside of the next box. Only two left. How deep is your nestbox? Many people think the moms haul the babies out. They don't. Usually it is when the babies latch on go nurse, have a good grip and get hauled out and drop off. My next boxes are wood, homemade,12" deep and I put a "baby scraper" on mind to prevent this from happening. They chill quickly outside the nestbox, mom can't get them back in, so they die. I am willing to bet she did not move the dead ones out, they were alive when they got out. I think the footprint of the box is about 12x14-ish. I made it as big as I could and still get it through the door. The front has a 2"tall lip on it. That's not tall enough to keep them in? What else is involved in a 'baby scraper'? If your theory is correct, and I don't doubt that it is, then the good thing is it means she's at least trying to take care of them. I am thinking no...the front of mine are 8", plus a baby scraper . Send a pic so I can see what exactly we are talking about please. My fabulous (not) nest box. It does have a top, though can't really see it in the picture. Oh gosh.. you want that front about 4x plus higher. I want to keep kits in until they are 4 weeks old. If they come it sooner you are going to have broken legs in the wire as well. If I was you,I'd cut a 6" piece to put on the front and screw it on in a hurry. Goring out to do it right now!!! Send another pic of it when you are done. When I give the next boxes to the doe two days before she kindles, I put a coffee can of pine shavings in the nextbox like you have, and pack in a good flake and a half of straw. You might give the doe some straw now, to see if she makes more of a nest with it. You should not see any babies without digging around in the box. I think I would pull some hair off the mom and put it in. Too late. One of them was in the water bowl and the other was dead in the nest box. Guess that means I have time to sort out the next box design. Is there a good design somewhere i can follow? Maybe in that rabbit resource handbook? The one I tried (and that obviously failed miserably) was essentially same as the ones I've seen for sale here and same as guidance I was given locally. I also referred back to 'story book of rabbit raising' and he doesn't mention much of anything about high sides and rabbit scrapers -- only gives dimensions on the size of the footprint and guidance on materials. Also, I now have 2 does that have lost litters. I should breed them both back immediately, right? Breed them both back tomorrow morning/and evening. I will try to find pics of mine tonight. Got one bred back today. Going to do the other tomorrow as I'm not sure how much time the buck needs in between. None of the books address these questions, give good descriptions like you have here and in past threads. I'm thinking that (in your vast amounts of spare time) you should write a book on rabbit raising. There seems to be a need for a good and thorough one! In addition to next box size/pics, can you comment on what size cage you like? I have 4 now and am thinking of getting some more. The ones I have are relatively large - 30" deep. I am finding that my rabbit s are pretty good at hiding in the back cornet and I pretty much have to try to get my whole head and shoulders through that little door in order to catch one. Thus, thinking maybe I should get some 24 inches deep for most of the time and just use the larger ones as grow-out pens for after weaning. (I also thought about putting dividers into the existing cages, but it seems like they might be too small then - -they would end up about 30x18.) Thoughts/recommendations? I am more than happy to write a rabbit book if you want to help me write it. I actually do own a homesteading magazine which had been on "vacation" the last couple years due to the kafuffle, divorce court, and being homeless. As soon as the house is build I can continue it. I have a partner now on it, which is awesome!!!! I prefer all wire 30x36" cages. I do not use grow out cages. They get butchered at 56 days. The feed to meat ratio sinks after this time period. Save your money on cages and buy a scale instead. I got my 56 day weight from 3# to 5.5# at 56 days in three generations. Learn to breed and judge meat rabbits (I have a great thread on it here, but with my website being hidden right now until December, the pics are hidden in that ghread - sorry), keep GOOD records, and use that scale. The only reason you should have grow out cages is for replacement breeding stock. If you have to use grow out cages to get meat on your animals, you are doing something wrong. You want 4# of feed (or less) to #1 of meat (or more).. if it is over 4# of feed, you are losing money. Cull HEAVY!!!!! Cages now are 30x36 and it just seems hard to get them out of the back of the cage for handling. Was just thinking 24x36 would be an easier size from a management perspective. Maybe grow out cages isn't the right term. At what point do you wean the rabbits? Are you leaving them all in with Mom until they are 56 days and get butchered? From what I ready, it sounded like you would want to wean the kits and rebreed the doe at about 6 weeks. No? At that point, you want the kits in another cage, right? That's what I was referring to as a grow out cage. But maybe it's not needed. I was just thinking that a doe and eight +/-4# kits would be a lot in a single cage as ou approach that 8th week. How high/ low are your cages set? I usually have mine at least four feet off the floor, maybe to three inches below my armpit, and me being 5'6", I can reach to the back of the pens. You might check the height if your pens. The day I wean them at 56 days, is the day they get butchered and go into the freezer. I weigh all of the kits, check their conformation, and anything not acceptable to me is culled. I have tough criteria in order to get a cage of your own in my rabbitry. Sometimes I keep one or two, sometimes I won't keep any for months. When in full production, I have around ,80 head, so yeah, I am culling heavy if I keep so little. I don't sell pet stock, and I don't sell breeding stock or show stock that I wouldn't be proud to have in my barn. If deemed worthy to stay in my barn, they get a tattoo in their left ear, and records made out, starting with their ear number, weight at 56 days, Pedigree and other notes. The dam gets bred the next day. Did you get a new front on the nestboxes? Ok. I only have 4 cages. Figured I would start small until I got things sorted out. They are all full at this point, with one of them split in two with a plywood divider. So I already need to butcher one or two. I have them stacked 2 tall. One is about 6 inches off the ground and I think the bottom of the other is at about 3 feet. I'll just keep them as is for now. No changes yet to the front of the nest box. Figured I have about 27 days now to do that. So it's been a month since bred back the one rabbit after the first debacle. New next boxes made and ready. Watching the calendar. Put the next box in a couple days ago. Watching for hair pulling, etc. Nothing....but rabbit is climbing in and out of the box .. i can tell because the straw I put is is nested up nice. Then this morning i go out and there are 9 dead babies in on the cage bottom and the nest box is empty except for a little poop. <sigh> These animals are driving me nuts. What do I need to do to get these girls to USE the nest boxes? Did you put it in her potty corner? Is there nocturnal animals or dogs? Sometimes they deserve to go into the Crock-Pot. Mine get three chances. That includes pulling off a litter of 8+, if less than that, that is a strike against her. She has to raise them all to 4.5# or better at 56 days or that is a strike against her again, etc. In my book she has one more chance before the stewpot. Not in potty corner. I kind of put it in the middle of the back of the cage. No nocturnal animals -- they are closed up in the barn. Ok, I'll try putting a crock-pot in the cage and see if she gets the message! The other weird thing.... she pulled fur 2 days AFTER she had the babies. i.e.. They were all out of the cage, I removed the next box, and THEN she pulled fur and stuck it in the corner. Weird. Update: Two more litters born end of Nov, about 3 days apart. One with 8 kits and one with 9. Of course, they didn't use the nest boxes, but both does pulled lots of fur and also material from the nest box to make their own nests. After I was sure they were done having babies, I lifter the mass of babies up and put it in the next box. All went well after that. All are alive and doing well, even in our freezing temps (around zero most nights these days). Removed the main nest boxes at 3 weeks and replaces with shallow cardboard boxes with some litter in it. (Probably not necessary, but i wanted them to have a place to stay warm in the cold temps.) Those shallow boxes will come out today. Eight week mark will be end of January, so planning to weigh, butcher, and rebreed at that time. Don't take them out at three weeks though. They usually don't come out until four weeks, and at that point I flip the nestbox on its side. Mom can still get up and away from babies, and at six weeks inpull the next. At eight weeks, weigh and butcher culls.